Perth took AIME by storm this year, with 12 members joining the PCB team to represent our beautiful State in front of over 2,500 buyers, exhibitors and media who attended the three-day event. PCB Executive Director of Stakeholder Relations, Nicolle Davey, said that it is important for Perth to have a strong presence at AIME as it is one of the most important tradeshows in Australia and the Asia Pacific region for the business events and incentive markets. “AIME is a must attend tradeshow for any destination in the region,” Nicolle said. 2019 was the first time AIME was organised by Talk2 Media after many years of Reed Exhibitions running the tradeshow, and the program was spiced up with the addition of a Knowledge Day. Networking opportunities were also increased, with a Monday night Welcome Evening at The Peninsula, Tuesday night Networking Evening at Showtime Events Centre and catered morning and afternoon tea on both days on the tradeshow floor. A special thank you to our members who attended AIME with us: Accor Hotels, AVPartners, Cable Beach Club Resort and Spa, Crown Perth, Esplanade Hotel Fremantle by Rydges, Fraser Suites Perth, Hyatt Regency Perth, Optus Stadium, Pan Pacific Perth, PAV Events, Perth Convention and Exhibition Centre and The Westin Perth. 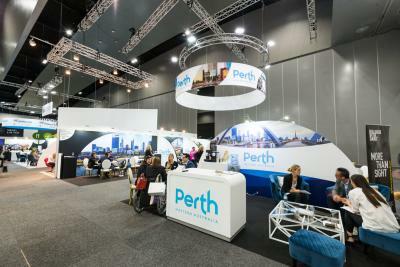 Your support is vital to showcase Perth and WA as an outstanding business events and incentive destination.